Azarga Uranium Corp. (TSX: AZZ) / (OTCQB: AZZUF) is an integrated uranium exploration & development company that controls 11 uranium properties / projects / prospects in the U.S. (South Dakota, Wyoming, Utah & Colorado) and in the Kyrgyz Republic, with a primary focus on in-situ recovery (“ISR”) projects in the U.S. 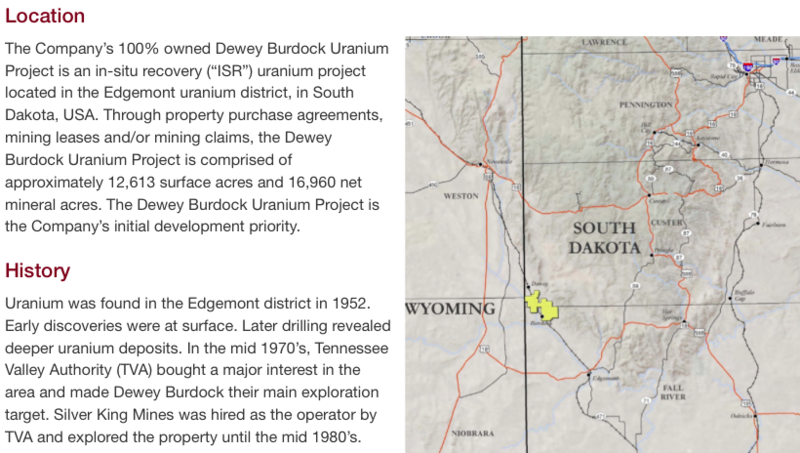 The Dewey Burdock ISR uranium project in South Dakota is the flagship project. Azarga Uranium’s main asset, the Dewey Burdock ISR uranium project possesses a sector-leading combination of grade & scale for an ISR project in the U.S. and has been obtaining key regulatory approvals over several years. However, during most of this time, uranium prices were very weak, only recently rebounding to US$29/lb., before pulling back a bit to ~US$26/lb. currently. The spot price was as low as ~US$17.50/lb. in the 4th qtr. of 2016. I caught up with the CEO of​ ​Azarga Uranium, Blake Steele, in New York and had the opportunity to discuss Azarga Uranium and the broader uranium sector. In short, he noted that interest in uranium & uranium juniors was high, especially for U.S. juniors due to the Section 232 Petition sitting with the Dept. of Commerce. Azarga Uranium’s recently completed financing would seem to validate this. Azarga Uranium easily raised C$3.0M, the bulk of which was taken up by institutions, further validating the quality of the Company’s assets. The Company is well funded. The ​Section ​232 Petition seeks to reserve 25%​ ​(a quota) of the U.S. nuclear market for U.S. uranium production only. That equates to ~11 M pounds/yr. To Blake’s credit, he did not guarantee a positive Section 232 outcome, but he did note that the Company is well positioned regardless of the outcome. He added that some investors felt that no matter what happens, the lifting of the uncertainty should get utilities off the fence and back to the table for long-term contract negotiations. The nuclear reactor pipeline exceeds pre-Fukushima levels. Given substantial supply cuts that have occurred since 2016, with more cuts to come, and some mines coming to the end of their lives — primary uranium production could fall short of global consumption by ~40 M pounds this year. “Globally, supply has been slashed. Producers have eliminated more than 35 million pounds of mined supply since 2016. In conjunction, utilities have been “under buying” in recent years running down stockpiles and contract positions. All the while, demand in the sector is growing with the global reactor pipeline exceeding pre-Fukushima levels. Companies such as Cameco have shut down mines and are buying large volumes in the spot market. Current uranium prices present an unsustainable situation, especially with Cameco and financial buyers buying in the spot market. Yellow Cake PLC​ ​reportedly acquired 8.4 M pounds to stockpile. Cameco ​has shut down its largest mine and ​is buying 11-15 M pounds in the spot market ​this year to fulfill its contracts.​ In my opinion, Cameco ​could ​be buying spot again next year if prices remain below the low US$40’s/lb. Blake​ ​thinks prices are headed higher in 2019 and subsequent years. There’s been talk of a psychological barrier at US$30/lb. that has to be overcome. Some think that once US$30/lb., is breached, US$35/lb. could come soon after. I believe that if US$35/lb. is reached this year, select uranium companies, including Azarga Uranium, will see their share prices move meaningfully higher. For Azarga, I continue to look at it as a free option on a good Section 232 outcome (which is hard to define or quantify!). I also believe that the probability of a takeout of the Company has increased, and importantly, that the universe of prospective acquires has expanded. That’s pretty compelling as far as near-term catalysts go. If there’s a 25% quota coming, owning a U.S. near-term producer would be like printing money. Bottom line, let’s just say that Azarga is 12 months from final approvals, it could then raise capital, perhaps with a strategic partner, and construct an ISR mine. The cap-ex needed is only US$27 M. Azarga could be in initial production in 2021. Possibly having contracted for 5-10 years in a Section 232 setting, where a bifurcated market has U.S. sourced uranium trading at a premium. Further, in 2021, the U.S. would be short of its ~11 M pound quota, so Azarga could potentially ramp up production in the early 2020’s more rapidly than it otherwise would.